Background: Tetrahydroindazole, a member of the fused-pyrazole system, is a least studied class of heterocyclic compounds owing to its scarcity in nature. However, a large number of synthetically prepared tetrahydroindazoles are known to show a variety of biological activities such as interleukin- 2 inducible T-Cell kinase inhibitors, AMPA receptor positive allosteric modulators, antitumor, antituberculosis, anti-inflammatory and antimicrobial activities. Vilsmeier-Haack reaction is one of the most important chemical reactions used for formylation of electron rich arenes. Even though Vilsmeier- Haack reaction was studied on a wide variety of hydrazones derived from active methylene compounds, literature lacks the examples of the use of 4-substituted cyclohexanones as a substrate for the synthesis of 4,5,6,7-tetrahydroindazoles. The study of the reaction of Vilsmeier-Haack reagent with hydrazones derived from cyclic keto compounds having active methylene has been considered the interested topic of investigation. In the present study, ethyl cyclohexanone-4-carboxylate was treated with one equivalent of various hydrazines for two hours and the resulted hydrazones were further treated with an OPC-VH reagent (Vilsmeier-Haack reagent isolated from phthaloyl dichloride and N,Ndimethylformamide) afforded 4,5,6,7-tetrahydroindazoles in excellent yields. The synthesized compounds 4a-f and 5a-f were screened for their antioxidant activities using the DPPH radical scavenging assay. The target compounds were synthesized regioselectively using 4+1 approach in excellent yields. A number of experiments using both conventional heating as well as microwave irradiation methods were tried and on comparison, microwave irradiation method was found excellent in terms of easy work up, high chemical yields, shortened reaction times, clean and, no by-products formation. Some of the synthesized compounds showed significant antioxidant activity. 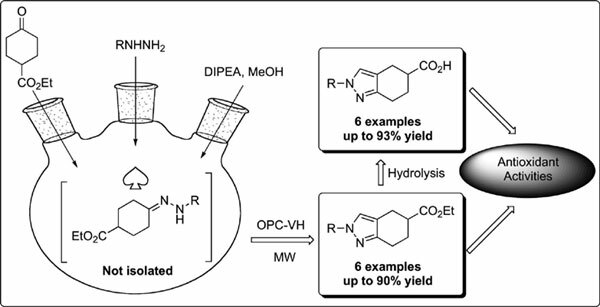 The microwave assisted synthesis of 4,5,6,7-tetrahydroindazoles from ethyl cyclohexanone-4-carboxylate has been reported under mild conditions in excellent yield. Easy work up, high chemical yield, shortened reaction times, clean and no by-products formation are the major advantages of this protocol. These advantages may make this method useful for chemists who are interested in developing novel 4,5,6,7-tetrahydroindazole based drugs. 4, 5, 6, 7-Tetrahydroindazoles, OPC-VH reagent, microwave, halomethyleniminium salts, antioxidants, antimicrobial activity.